Authors: Barbara Brockway, Ph.D., Ben Liang, Ph.D., Yuhua Sun, Julia Krumsiek and James Hayward, Ph.D. Allegations have recently surfaced regarding the amount of Aloe vera contained in several finished products. In response to intense scrutiny from the press, several class action lawsuits have been filed against the manufacturers of these products. Applied DNA Sciences (“Applied DNA”) conducted independent testing of some of the products cited in these lawsuits. Commercial samples were analyzed for the presence of Aloe vera Bar Code of Life (BCOL). Testing revealed that Aloe vera BCOL was absent from Aloe vera gel products, and was unreliably detectable in three off-the shelf skin care products made by a leading global brand that prides itself on its well–managed supply chain. Since the products tested were made with either Aloe barbadensis Leaf Juice or Aloe barbadensis Leaf Juice Powder, the inconclusive results may be due to the BCOL being damaged during processing. Further testing indicated that when concentrated Aloe barbadensis Leaf Juice Powder was tagged with SigNature DNA (prior to being incorporated into the same three off-the-shelf finished products), the molecular tag was 100% detectable even at serial dilutions down to 1 million-fold. The results of our laboratory testing indicate that DNA-tagged botanicals can be readily authenticated, even in complex cosmetic products in which the tag is present at extremely low levels. Recent reports in Bloomberg Businessweek found that 1H NMR analyses could not detect the presence of the acemannan (unique sugars known to occur in Aloe vera) in off-the shelf Aloe vera Gels purchased from major US retailers. The journalist concluded that the ingredient behind the driving claims was absent. Another method of identifying botanical materials in mixtures is to look for the plant’s Bar Code of Life (BCOL) DNA. Laboratories in the US recently failed to find the BCOL for the botanicals in certain in store-brand herbal supplements and as a result, in February 2015, the New York Attorney General asked the companies involved to provide information such as how the ginseng, St. John’s wort, echinacea and garlic were processed. GNC Holdings Inc., Target Corp., Wal-Mart Co., and Walgreens Inc. were instructed to stop selling these products as tests showed these supplements did not contain the ingredient as advertised. Scientists from Applied DNA Sciences (APDN) examined the Aloe vera gels reported in Bloomberg Businessweek to have no acemannan and found no evidence of BCOL DNA from Aloe vera. In this paper, we report the results of our study on three Aloe vera skin care creams, which led us to the conclusion that BCOL is not a reliable method for identifying botanicals in cosmetics and related products. Water, Ethylhexyl Palmitate, Glycerin, Propylene Glycol, Pentylene Glycol, Dimethicone, Isononyl Isononanoate, Sesamum Indicum Seed Oil/Sesamum Indicum (Sesame) Seed Oil, Stearyl Alcohol, Glyceryl Stearate, PEG-100 Stearate, Lanolin, Polyglyceryl-3 Beeswax, Alpha-Glucan Oligosaccharide, Tocopheryl Acetate, Xanthan Gum, Aloe Barbadensis Leaf Juice Powder, Levulinic Acid, p-Anisic Acid, Sodium Levulinate, Sodium Hydroxide, Avena Sativa Kernel Extract/Avena Sativa (Oat) Kernel Extract, Potassium Sorbate, Tocopherol. 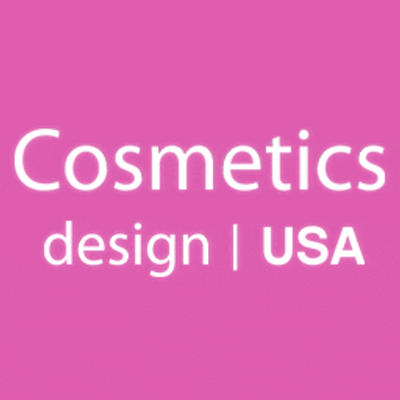 Water, Isononyl Isononanoate, Glycerin, Pentylene Glycol, Cyclopentasiloxane, Butylene Glycol, Cetearyl Alcohol, Myristyl Myristate, Sesamum Indicum Seed Oil/Sesamum Indicum (Sesame) Seed Oil, Cyclohexasiloxane, Cetyl Alcohol, Myristyl Alcohol, Palmitic Acid, Stearic Acid, Cetearyl Glucoside, Aloe Barbadensis Leaf Juice, Myristyl Glucoside, Acrylates/C10-30 Alkyl Acrylate Crosspolymer, Bisabolol, Xanthan Gum, Avena Sativa Kernel Extract/Avena Sativa (Oat) Kernel Extract. Water, Glycerin, Pentylene Glycol, Caprylic/Capric Triglyceride, Butylene Glycol, Glyceryl Stearate Citrate, Isononyl Isononanoate, Elaeis Guineensis Oil/Elaeis Guineensis (Palm) Oil, Myristyl Myristate, Octyldodecanol, Sesamum Indicum Seed Oil/Sesamum Indicum (Sesame) Seed Oil, Squalane, Cetearyl Alcohol, Cetyl Alcohol, Butyrospermum Parkii Butter/Butyrospermum Parkii (Shea) Butter, Panthenol, Aloe Barbadensis Leaf Juice Powder, Acrylates/C10-30 Alkyl Acrylate Crosspolymer, Xanthan Gum, Bisabolol, Polylysine, Sodium Hydroxide, Disodium EDTA, Myristyl Alcohol, Stearyl Alcohol, PEG-30 Dipolyhydroxystearate, Trideceth-6, Avena Sativa Kernel Extract/Avena Sativa (Oat) Kernel Extract, Citric Acid. 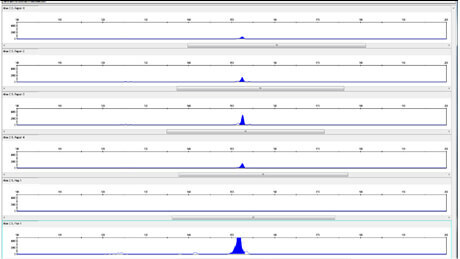 The Bar Code of Life (BCOL) sequences were verified with fresh Aloe plants (data shown as the positive controls in figures 1 – 3). 150 mg of each of the skin creams containing Aloe vera was used for standard DNA extraction. Polymerase chain reaction (PCR) and Capillary Electrophoresis (CE) analysis were performed to identify the Aloe BCOL segments. Each cream was sampled 4 times. The source of Aloe vera used in this study was a commercially-sourced Concentrated Aloe barbadensis Leaf Juice Powder. DNA tag was tested at two concentrations in the Concentrated Aloe barbadensis Leaf Juice Powder differing by 10-fold and designated as 1X and 10X, DNA-tagged Aloe vera powder was integrated in the three creams: Day Cream A, Night cream B and Rescue cream at 1%. The DNA cream was serially diluted with their original cream to 1 million-fold. DNA was extracted and authenticated at each dilution by PCR/CE. 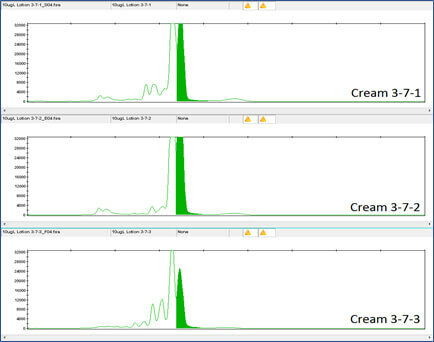 Figure 1 shows the results for Day Cream A and Figure 2 shows the results for Night Cream B. In each case, the BCOL was only detected in only one of the four samples from both creams. Variability in detection was likely the results of extremely low levels of intact BCOL DNA present in both creams. Results for Rescue Cream are shown in Figure 3. Rescue cream yielded BCOL DNA in all the samples tested. As both Night Cream B and Rescue Cream use Aloe barbadensis Leaf Juice Powder, the powdered (and hence more concentrated) form of the Aloe barbadensis Leaf ingredient cannot solely explain the presence of the BCOL in all the samples taken from the Rescue Cream. The results for Day Cream A, shown in figure 1, which is made with Aloe barbadensis Leaf Juice, indicate that the aloe vera BCOL is vulnerable in both liquid Aloe Barbadensis Leaf Juice and in Aloe barbadensis Leaf Juice Powder. The DNA tag was easily detected when the creams were diluted 1 million-fold and the DNA tag was present at the lowest concentration in the Concentrated Aloe barbadensis Leaf Juice Powder (1X). 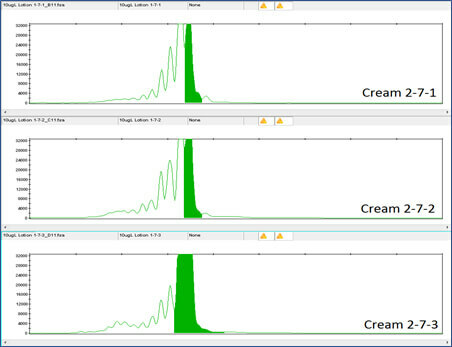 Figure 4 shows the DNA results for the 1 million-fold dilution of Day Cream A tagged with Concentrated Aloe barbadensis Leaf Juice Powder containing the lowest concentration of DNA tag, 1X Concentration. 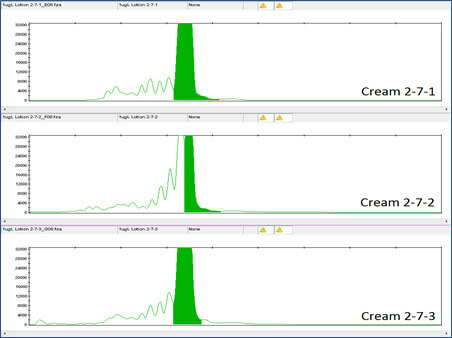 Figure 5 shows the DNA results for the 1 million-fold dilution of Day Cream A with Concentrated Aloe barbadensis Leaf Juice Powder containing the lowest concentration of DNA tag, at 10X Concentration. Clearly the DNA tag is reliably detectable even at this low concentration. DNA detection at this low level was also true for the DNA tags in Night Cream and Rescue Cream (see Figures 6, 7, 8 and 9). 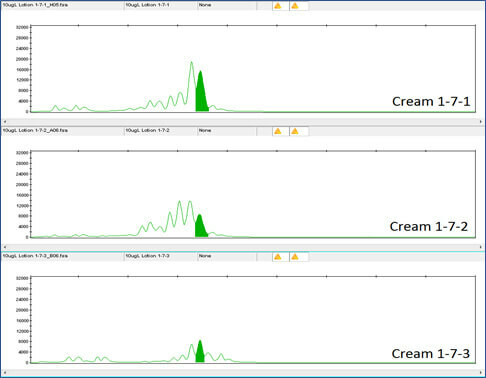 Figure 6 shows the equivalent data for Night Cream B, demonstrating the DNA results for the 1 million-fold dilution of Night Cream B with Concentrated Aloe barbadensis Leaf Juice Powder containing DNA tag at 1X Concentration. 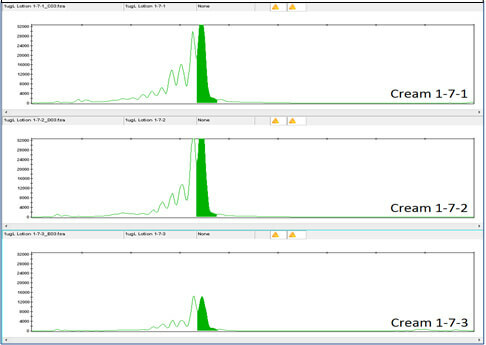 Figure 7 shows the DNA results for the 1 million-fold dilution of Night Cream B tagged with Concentrated Aloe barbadensis Leaf Juice Powder containing the lowest concentration of DNA tag, 10X Concentration. 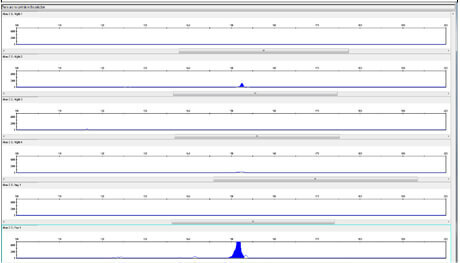 Figure 8 shows the DNA results for the 1 million-fold dilution of Rescue Cream tagged with Concentrated Aloe barbadensis Leaf Juice Powder containing the DNA tag at 1X Concentration. 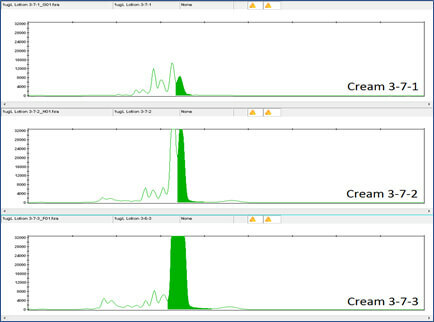 Figure 9 shows the DNA results for the 1 million-fold dilution of Rescue Cream with Concentrated Aloe barbadensis Leaf Juice Powder containing the lowest concentration of DNA tag, 10X Concentration. The data presented in this paper show that the BCOL cannot be relied upon as a marker for Aloe vera in all personal care products. DNA molecular tags, when added to Aloe Barbadensis Leaf Juice Powder, remain easily detectable even when the DNA tags were added to Aloe Barbadensis Leaf Juice Powder at 1µg DNA /kg, the DNA tagged Aloe Barbadensis Leaf Juice Powder was then included in the creams at 1% and the creams were further diluted up to 1 million-fold. The BCOL testing results reported in this study show BCOL DNA is (mostly) undetectable in finished goods, and SigNature DNA tags are detectable even after 1 million-fold dilution. How should we determine the presence of botanicals in complex formulas? Are the analytical techniques currently recommended for detecting Aloe vera reliable? What is the truth? How should we determine the presence of botanicals in complex formulas? Our results clearly show that DNA tags can be reliably used to tag Aloe Barbadensis Leaf Juice Powder and remain easily detectable in the complex skin cream even when diluted to 1 million-fold. 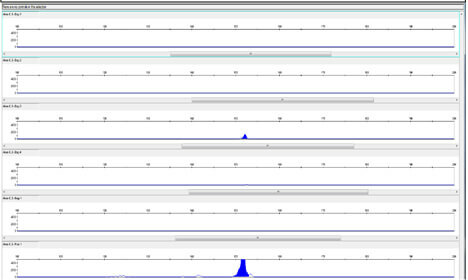 Looking at the strength of the signals at the added DNA tags at their lowest dilution, in all three products suggests strongly that the DNA tags are likely to be reliably detected at dilutions far greater than to 1 million-fold. Just as we would not set out on a journey without having a luggage label on our suitcase, it makes perfect sense to add unique DNA tags to raw materials about to journey through the supply chain. Once tagged, it is easy to determine the presence of Aloe vera (or for that matter, other botanicals) in complex formulas – not just in the personal care creams formulas described in this paper but, as the DNA tags are suitable for use in pharma and food, for a whole range of consumer products including botanicals such as ginseng, St. John’s wort, echinacea and garlic in health food supplements. Are the analytical techniques currently recommended to detecting Aloe vera reliable? The data presented in this paper show two products made using Aloe Barbadensis Leaf Juice Powder or Aloe Barbadensis Leaf Juice that the BCOL was detectable on only 25% of the tests. This poor performance could be due to several reasons, many of which are covered in the review by Parveen et al., (2016), which gives an overview on the strengths and limitations of DNA barcoding techniques for botanical ingredient identification. Based on the available information, these authors also do not recommend the use of BCOL as a sole means of species identification. 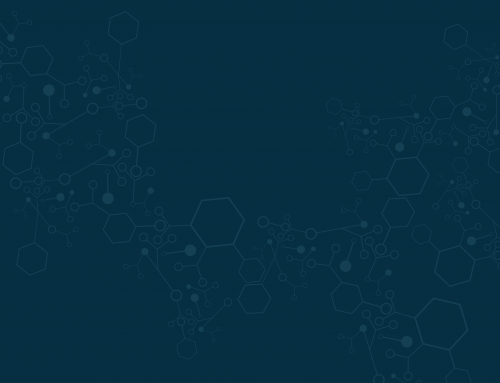 Unlike the tiny DNA tags, the BCOL is a large molecule that is far more susceptible to breakdown by nuclease and chemical degradation or lost through nonspecific binding. It therefore cannot be relied upon as the sole identifier of Aloe vera in products. Unpublished data from Applied DNA Sciences’ laboratories on BCOL for cotton supports the findings for Aloe vera and shows that the BCOL is not always suitable for the Cotton Supply Chain and by inference is not really suitable for Natural Product Supply chains in general (Michael Hogan, Private Communication, 2017). Acemannan is the traditionally recommended biochemical identifier for Aloe vera in extracts and products. This naturally occurring polysaccharide is considered unique to Aloe vera, where it is found mainly in Aloe vera leaf and Aloe vera juice. Other biochemical markers are used in conjunction with acemannan for Aloe vera identification because acemannan is known to break down in extracts. These supporting biochemical markers are not unique to Aloe vera and are commonly found in many other botanicals. For example, D-isocitrate, which is known as Aloe whole leaf marker or WLM, is also used as a marker to judge the quality of fruit products, including citrus juices. Orange juice is considered authentic when the ratio of citric acid to D-isocitrate is less than 130. A D-isocitrate ratio higher than 130 indicates that the orange juice may have been adulterated. D-Isocitrate therefore is not a unique identifier for Aloe vera. 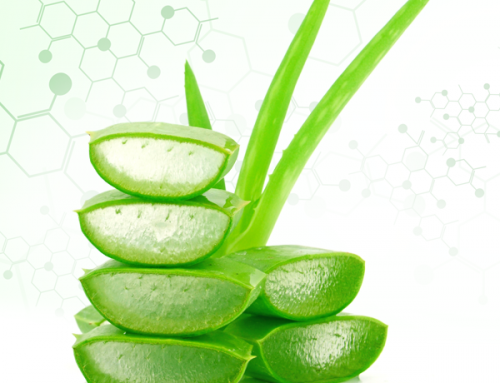 When asked, most experts agree that acemannan is a difficult molecule to measure in Aloe vera extracts and is even harder to detect in cosmetic formulas. 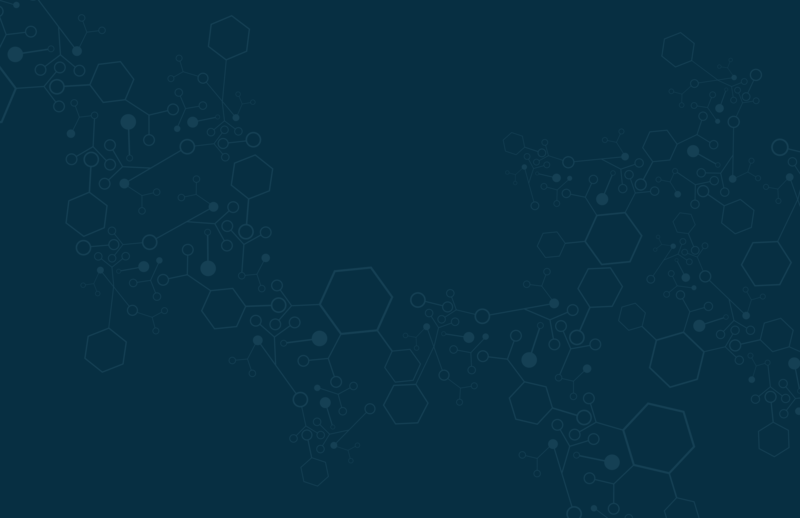 Chemists must employ specialized H NMR techniques, which are expensive and are not considered as general laboratory equipment. Acemannan is unstable at high temperatures. It is liable to enzymic degradation and it is readily fermentable. Acemannan is therefore very likely to be degraded in extracts and products during storage and processing, especially if control standards are poor. Scientists working at Nestle Research Center in Switzerland used acemannan and its related products in a survey of nine commercial Aloe vera gel powders from leading international suppliers. They found the quality was very inconsistent and found that only three contained satisfactory amounts of acemannan. The industry recognises that post-harvest handling has a direct impact on the quality and marketability of Aloe vera. To help control Aloe vera quality, the International Aloe Science Council (IASC) issues Facility Certification after on‐site inspection by an authorized IASC auditor (or by a correspondence audit of facilities that maintain current, IASC approved 3rd party certifications as well as meeting all other applicable requirements). 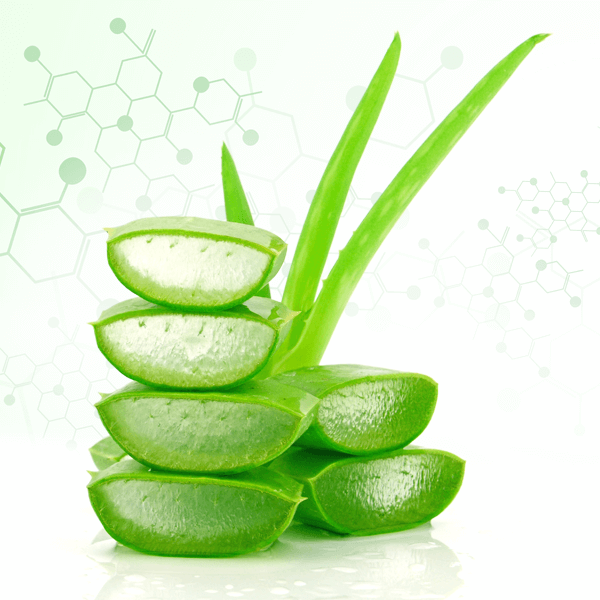 The IASC quality standard for Aloe vera raw materials, covers constituents such as polysaccharide content, D-isocitrate, and the other constituents typically found in Aloe vera. It is interesting to note that the IASC aloe vera quality standard is applicable only to raw material ingredients for use in products for oral consumption. 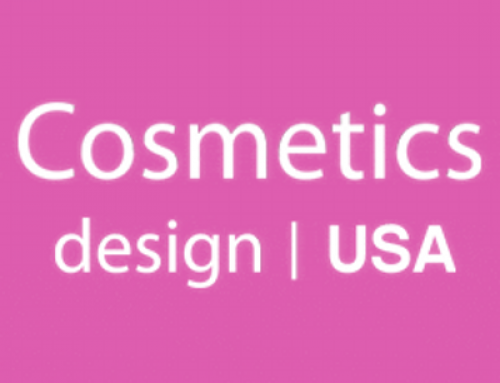 This standard is not applicable to finished products nor to raw materials intended for use in finished products for topical use. DNA molecular tags can enable Aloe vera to be forensically traced and tracked from the raw aloe leaves to the end-product. Tracing molecular tags can prove provenance as against paper audit trails which are very vulnerable to corruption.